"The accessible guide to learning the Mori language, no matter your knowledge level. Fun, user-friendly and relevant to modern readers, Scotty Morrison's Mori Made Easy workbook series is the ultimate resource for anyone wanting to learn the basics of the Mori language. While dic... read full description below. Professor Scotty Morrison (Ngati Whakaue) is the presenter of current affairs programmes Te Karere and Marae. He holds a Master's degree (Education), is working towards his PhD, and has been an Adjunct Professor and the Director of Maori Student and Community Engagement at Auckland's Unitec Institute of Technology. In 2017, he adopted a new role at Massey University's Te Putahi-a-Toi (School of Maori Art, Knowledge and Education), working alongside his wife Stacey in a strategic, advocacy and lecturing capacity. 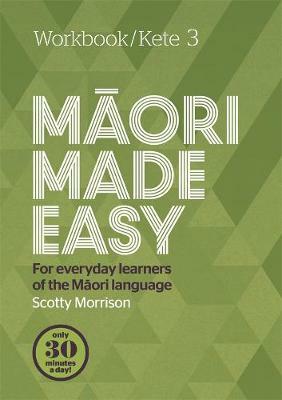 Scotty is the author of the bestselling language guides The Raupo Phrasebook of Modern Maori and Maori Made Easy, and Maori at Home, which was co-authored with Stacey. They live in Auckland with their three children Hawaiki, Kurawaka and Maiana.